Sun., May 6, 2018, 1:34 p.m.
YAKIMA, Wash. – Kelly Clayton desperately wanted to join wrestling in high school but didn’t because she thought it was unacceptable. “I was too afraid – there were no girls doing that,” the 34-year-old said one recent afternoon. During those years, she was quiet and mostly kept to herself. “The less attention you bring yourself, the safer you are,” Clayton said of how she once thought. But a broken heart followed by a sense of being lost – not knowing who she was – smashed Clayton’s perception of herself and motivated her to become what she’s always been, a fighter. At age 30, Clayton climbed into the cage for her first Mixed Martial Arts fight – she won by knockout in 40 seconds. From there, she built a 7-3 amateur record in MMA fighting and along the way collected 19 gold medals at Brazilian Jujitsu tournaments across the country. In April, Clayton – a habitat restoration biologist for Yakama Nation Fisheries – embarked on a professional MMA career in Great Falls, Montana, where she lost a crowd-pleasing close decision to Serena DeJesus. But Clayton isn’t hanging her head – instead, she’s preparing for her next pro fight scheduled for July 23 at the Emerald Queen Casino in Tacoma. Clayton’s heart was broken when her boyfriend ended their seven-year relationship. She was 25 at the time and felt she had lost most of herself when the relationship ended. She decided to keep busy and started working for the Yakama Nation and tended bar on weekends. She also completed a bachelor’s degree in science and a master’s in environmental science. But she still felt lost. Clayton began taking a deep look inside. She learned that she built a life on trying to please others, doing what she thought was expected of her. She thought she was supposed to get married and have children, and that her life would be a failure if she didn’t. She also prided herself on being the first person there whenever a crisis occurred. Even when Clayton started training in fighting, she’d let her desire to come to the rescue of others pull her away from the gym for long periods of time. Clayton learned she was co-dependent. “I was self-sacrificing,” she said. “I needed to feel needed and wanted to be liked. For a long time, my whole life, I don’t think I was ever happy. Clayton quit bartending. She said she only did it because it helped her come out of her shell, but in reality it provided a false sense of security. She didn’t date, and began freaking out about turning 30. At 29, she made decision to take action for herself – and fight. “I found something I wanted to do that had nothing to do with anyone else,” she said. She began setting boundaries with others, including family. Along the way, she gained a deeper understanding of herself. She began to accept the solid, strong frame she’s always had and the physical abilities that came with it. And so it was, with a 40-second knockout in her amateur debut at 30. One recent evening at Yakima Mixed Martial Arts in southeast Yakima, Clayton drove thunderous punches and kicks into a striking bag held by a stout man. Each strike echoed throughout the spacious gym on Ranch Rite Road in East Yakima. There, she often grapples and spars with men. Clayton even started dating again – her boyfriend is local MMA fighter Tony Solis. They share their lives with each other but have their own space and identities, she said. “It’s the first healthy relationship I’ve had in my life – I’m 34,” she said. 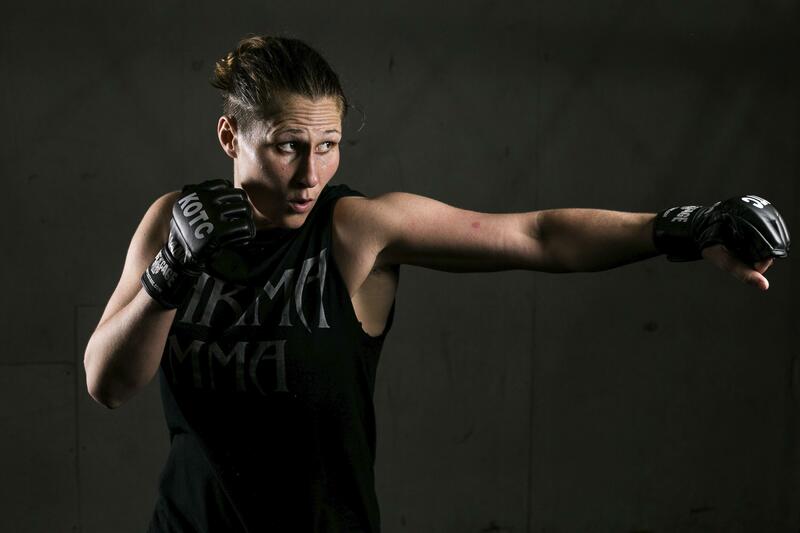 Rich Guerin, owner and operator of Yakima MMA, sees promise in her fighting career. “What she shows in the cage is only half of what she has,” said Guerin, who trained former UFC champion Miesha Tate early in her career. Guerin said Clayton sometimes thinks too much and that causes her to hesitate a bit. Guerin said he’s learned from her. She tends to be liberal-minded while he’s more conservative. In the gym, they call her Skittles because she’s always eating the candy. She’s taken Skittles as her fight name; she says it not only represents her lighter side but also the rainbow colors representing diversity. Clayton isn’t shy about sharing her past struggles with others. “If I can help somebody else in life, I’m going to show my scars,” she said. Published: May 6, 2018, 1:34 p.m.